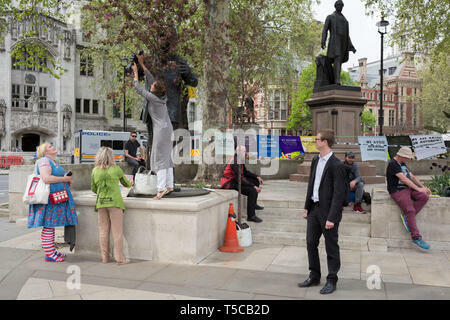 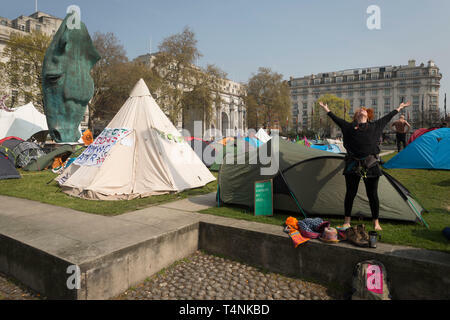 Women campaigners position a large potted tree at the feet of Nelson Mandela's statue in Parliament Square during the week-long protest by climate change activists with Extinction Rebellion's campaign to block road junctions and bridges around the capital, on 23rd April 2019, in London England. 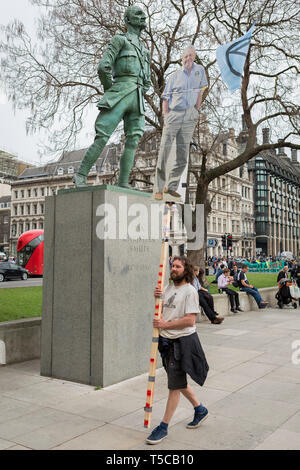 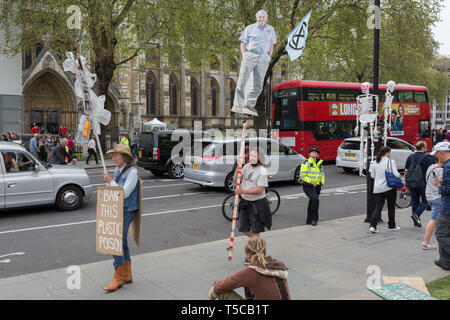 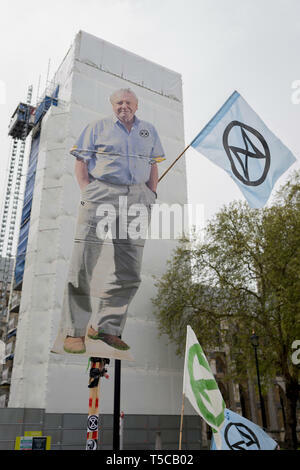 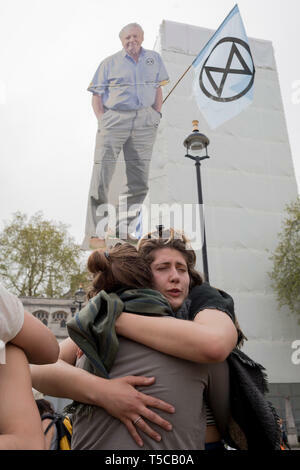 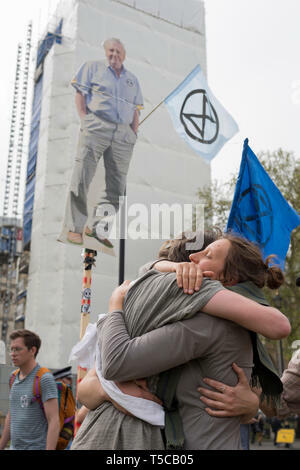 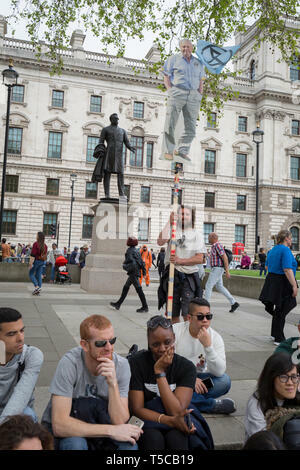 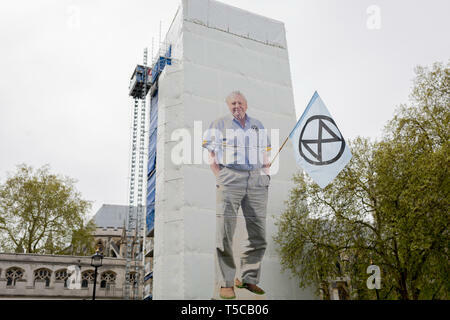 An image of veteran wildlife and environmental broadcaster Sir David Attenborough is held high in Parliament Square next to the statue of Field Marshal Jan Christiaan Smuts, the South African and British Commonwealth statesman, military leader and philosopher, during the week-long protest by climate change activists with Extinction Rebellion's campaign to block road junctions and bridges around the capital, on 23rd April 2019, in London England. 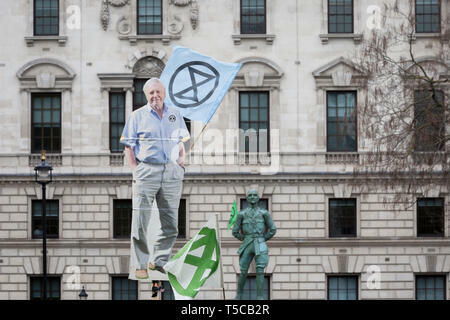 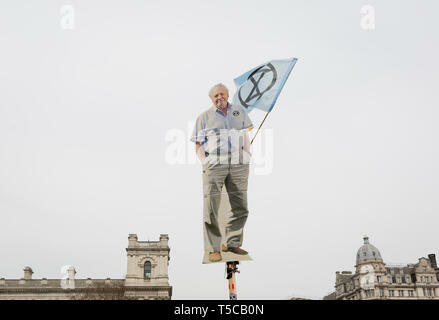 An image of veteran wildlife and environmental broadcaster Sir David Attenborough is held high in Parliament Square during the week-long protest by climate change activists with Extinction Rebellion's campaign to block road junctions and bridges around the capital, on 23rd April 2019, in London England. 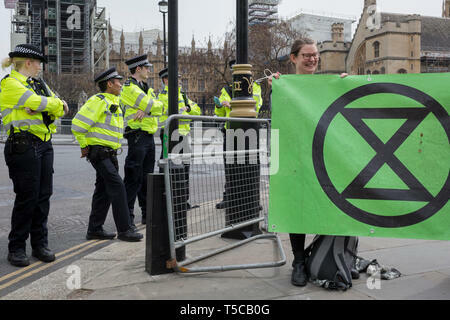 Police officers seal off Parliament Square during the week-long protest by climate change activists with Extinction Rebellion's campaign to block road junctions and bridges around the capital, on 23rd April 2019, in London England. 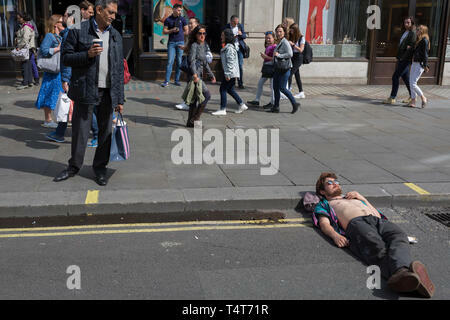 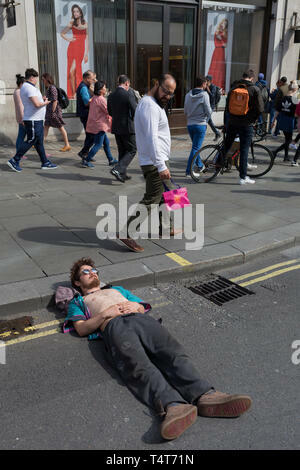 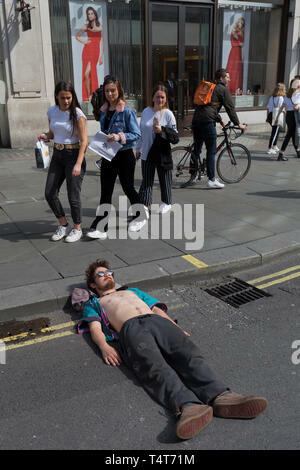 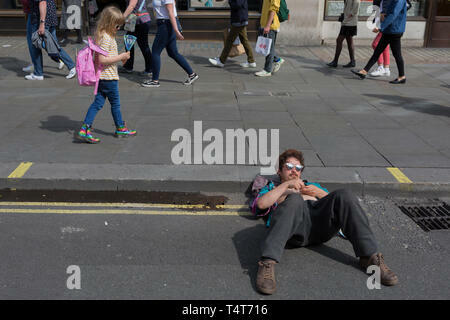 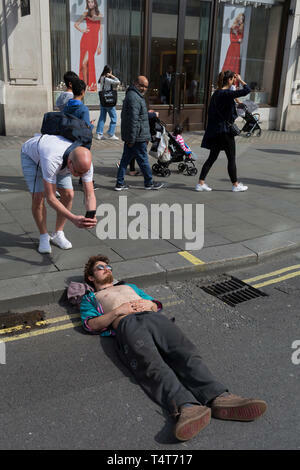 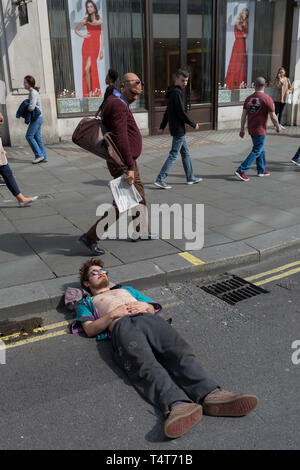 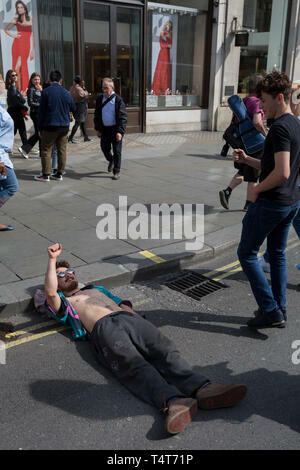 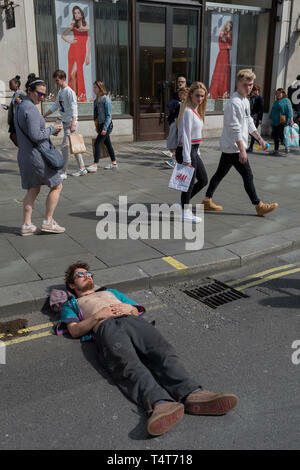 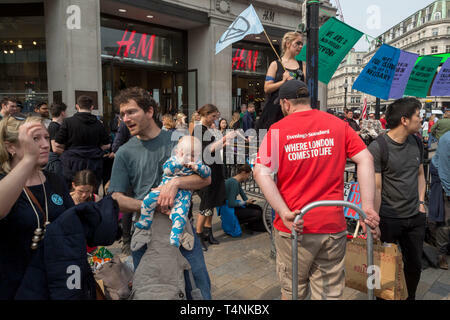 Passers-by look down on a young campaigner resting with his head on an Oxford Circus kerb on day 4 of protests by climate change environmental activists with pressure group Extinction Rebellion, on18th April 2019, in London, England. 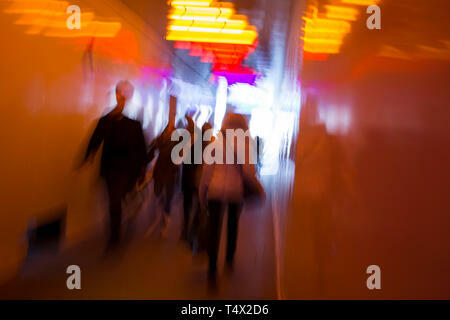 Blurred pedestrians walk through a multi-coloured tunnel under a large construction site in Knightsbridge, on 11th April 2019, in London England. 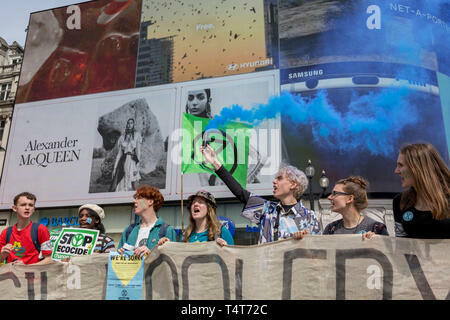 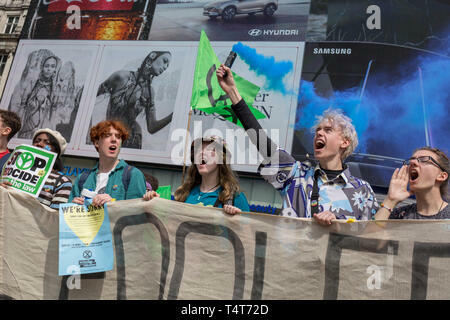 Beneath advertising, young campaigners block Piccadilly Circus on day 4 of protests by climate change environmental activists with pressure group Extinction Rebellion, on18th April 2019, in London, England. 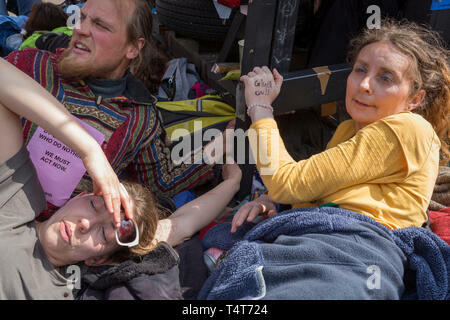 Campaigners locked and glues to a yacht in the middle of the occupied Oxford Circus on day 4 of protests by climate change environmental activists with pressure group Extinction Rebellion, on18th April 2019, in London, England. 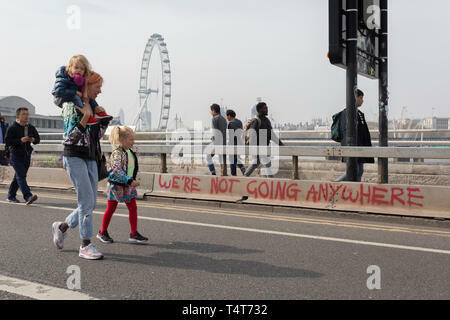 Commuters and visitors walk across the closed Waterloo Bridge on day 4 of protests by climate change environmental activists with pressure group Extinction Rebellion, on18th April 2019, in London, England. 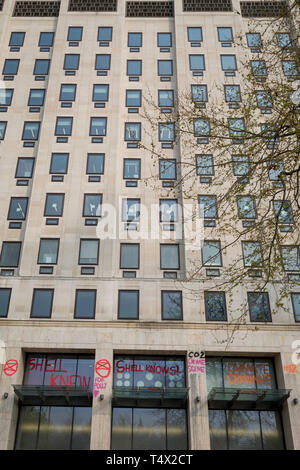 As protests continue across the capital by climate change activists with Extinction Rebellion, graffiti remains on the outside of Shell's London headquarters on the southbank, on 18th April 2019, in London, England. 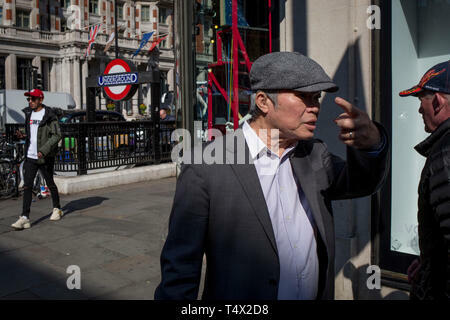 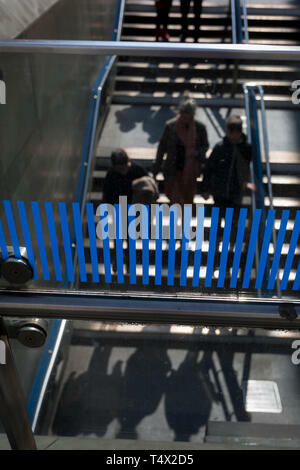 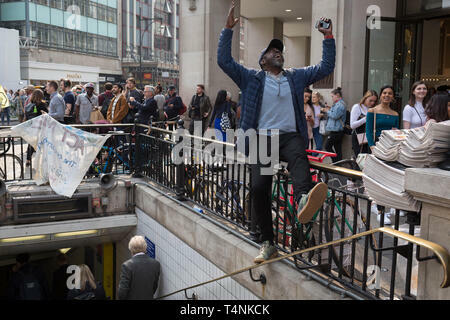 Pedestrians walk up and down the steps at Knightsbridge underground station next to the Harrods Department store, on 15th April 2019, in London, England. 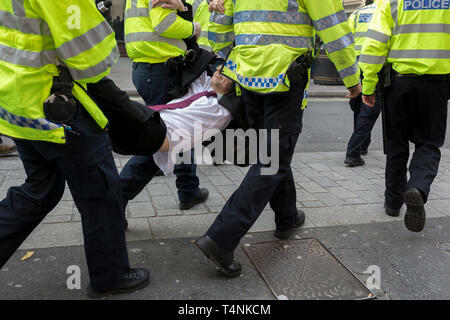 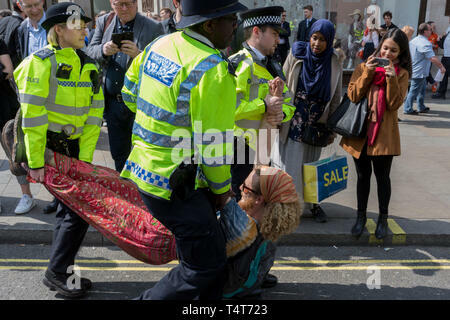 A protester is arrested by Met police officers at Oxford Circus on day 4 of protests by climate change environmental activists with pressure group Extinction Rebellion, on18th April 2019, in London, England. 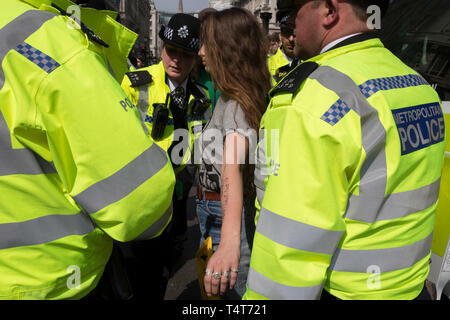 A young woman protester is arrested and searched by Met police officers at Oxford Circus on day 4 of protests by climate change environmental activists with pressure group Extinction Rebellion, on18th April 2019, in London, England. 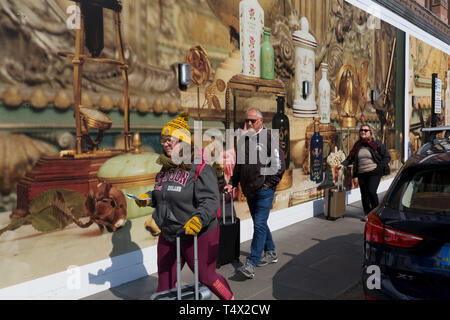 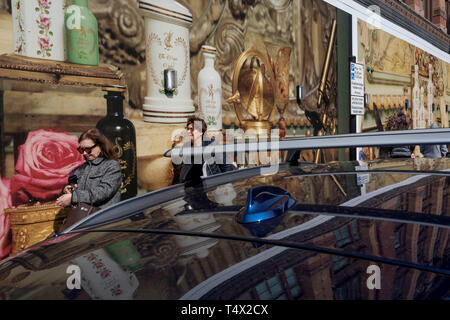 The temporary hoarding wrapped around the read of the Harrods Department store in Knightsbridge, on 15th April 2019, in London, England. 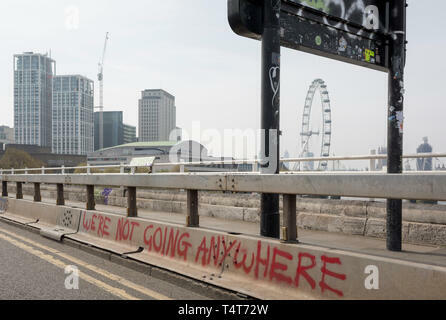 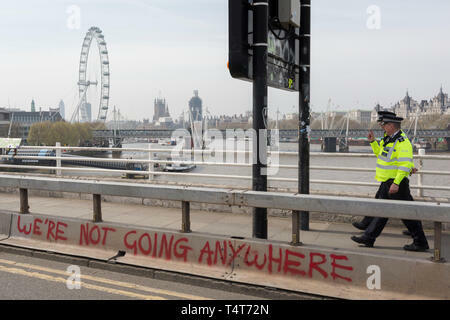 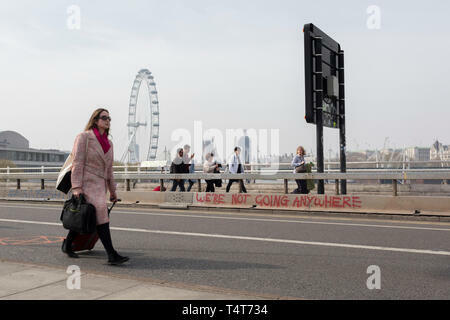 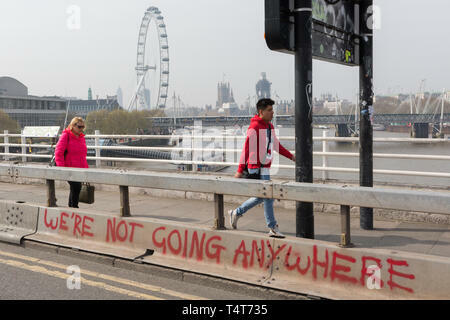 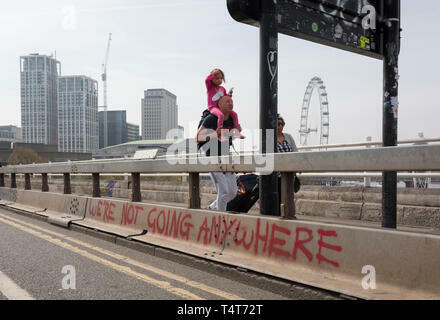 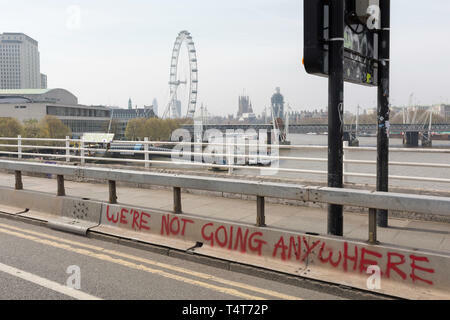 The London skyline beyond graffiti on Waterloo Bridge on day 4 of protests by climate change environmental activists with pressure group Extinction Rebellion, on18th April 2019, in London, England. 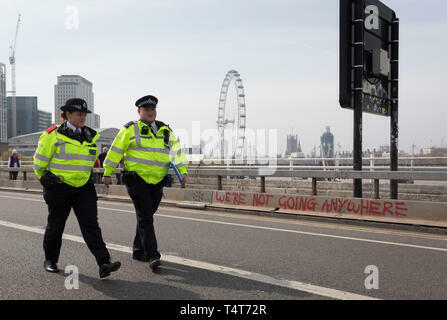 Met police officers walk across the closed Waterloo Bridge on day 4 of protests by climate change environmental activists with pressure group Extinction Rebellion, on18th April 2019, in London, England. 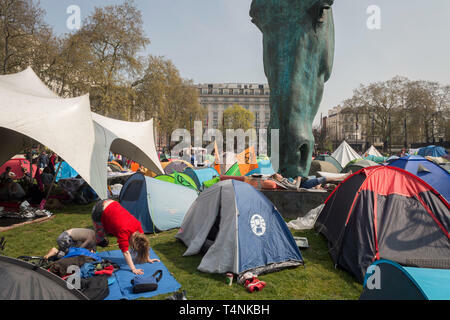 The Met have been criticised for allowing the protests to continue their occupations of major roads and junctions such as Waterloo Bridge and Oxford Circus. 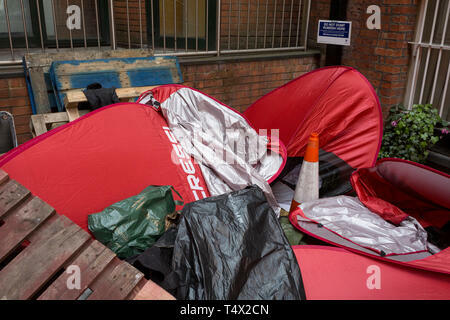 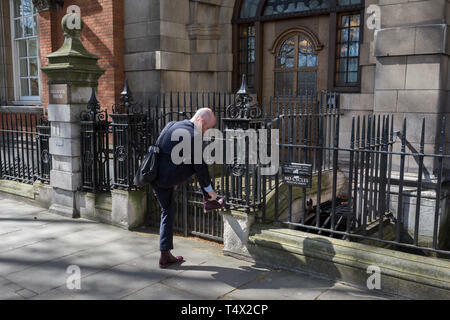 Days after the arrrest of Julian Assange in Knightsbridge, assorted rubbish is still piled up at the rear of the Ecuadorian embassy, on 15th April 2019, in London, England. 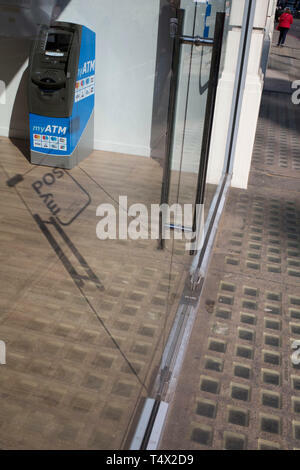 A my ATM cash dispenser in the window of a Knightsbridge money changer, on 11th April 2019, in London, England. 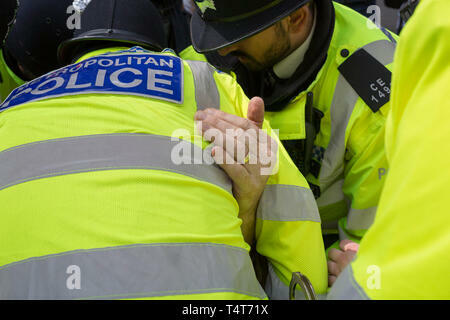 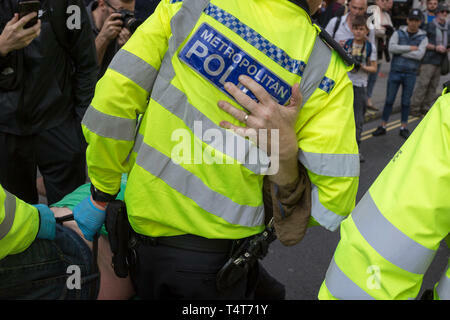 A young male protester is arrested and searched by Met police officers at Oxford Circus on day 4 of protests by climate change environmental activists with pressure group Extinction Rebellion, on18th April 2019, in London, England. 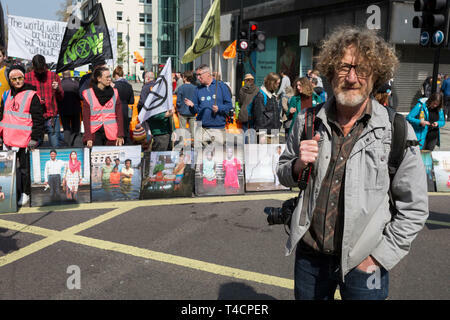 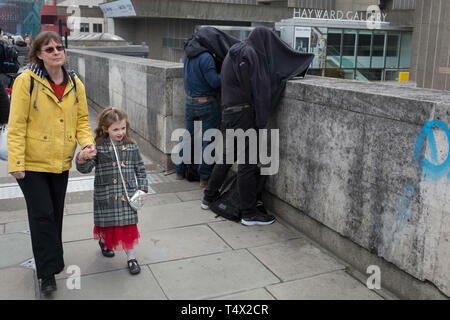 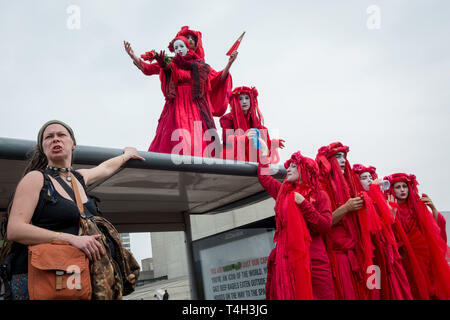 Press photographers work under dark conditions while activists with Extinction Rebellion campaign for a better future for planet Earth after blocking Waterloo Bridge and as part of a multi-location 5-day Easter protest around the capital, on 16th April 2019, in London, England. 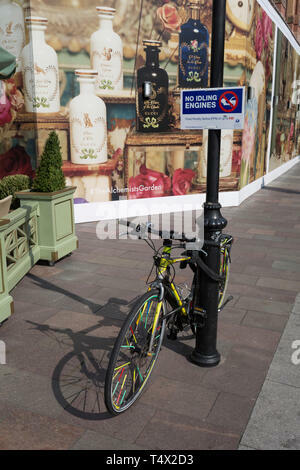 A No Idling Engines sign aimed at waiting black cab drivers, and a locked-up bike at the rear of the Harrods Department Store in Knightsbridge, on 15th April 2019, in London, England. 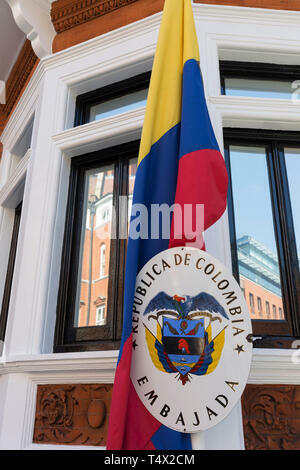 The exterior of the Columbian embassy in Knightsbridge, on 11th April 2019, in London England. 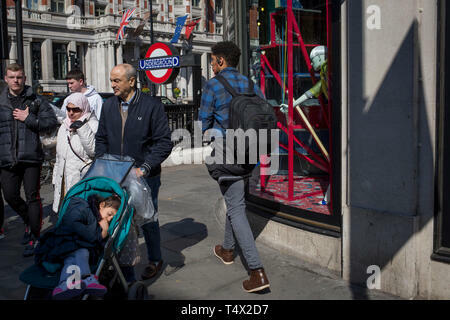 Passers-by walk outside the Harvey Nichols department store on the corner of Knightsbridge and Sloane Street, on 11th April 2019, in London, England. 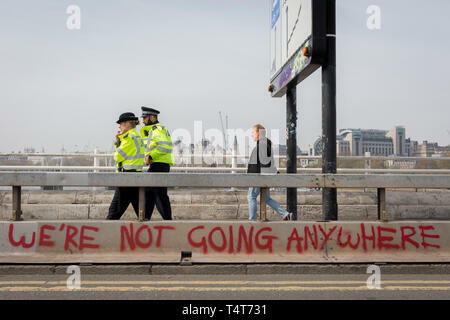 Met police officers talk at a banner on the north end of Waterloo Bridge on day 4 of protests by climate change environmental activists with pressure group Extinction Rebellion, on18th April 2019, in London, England. 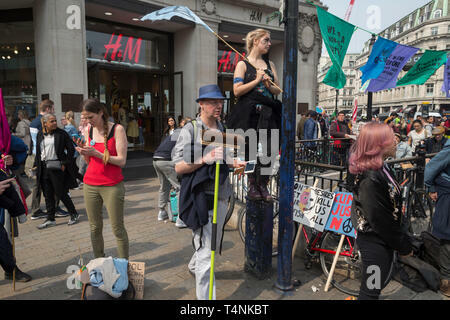 The Met have been criticised for allowing the protests to continue their occupations of major roads and junctions such as Waterloo Bridge and Oxford Circus. 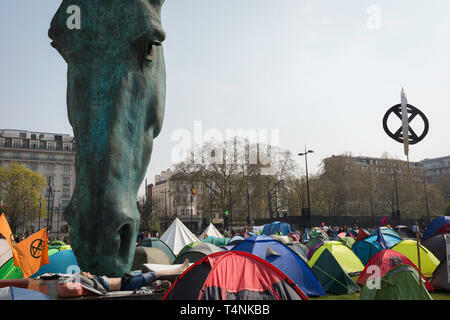 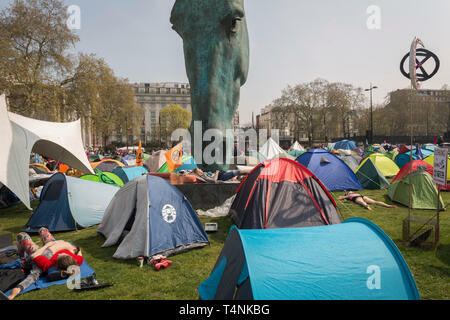 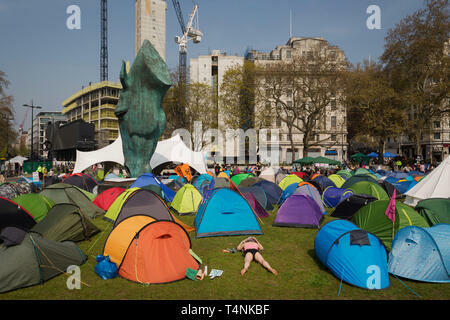 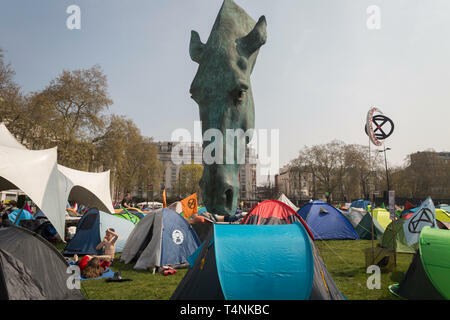 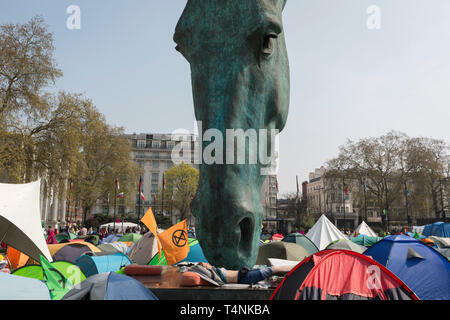 The tents of activists with Extinction Rebellion occupy Marble Arch about climate change beneath the sculpture entitled Horse by Nic Fiddian-Green, on 17th April 2019, in London, England. 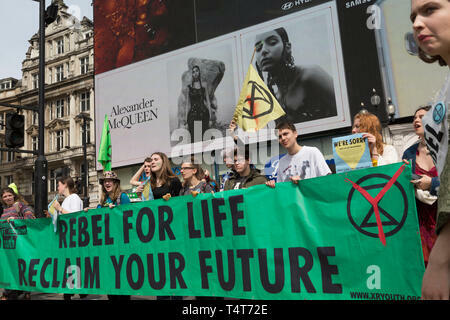 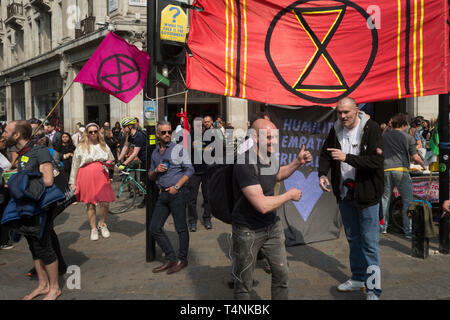 Activists with Extinction Rebellion protest about climate change in a blocked-off Oxford Circus, on 17th April 2019, in London, England. 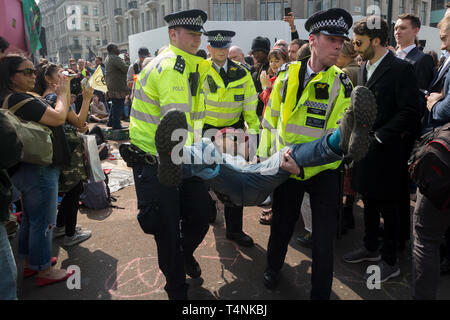 An activist with Extinction Rebellion is arrested during the London protest about climate change in a blocked-off Oxford Circus , on 17th April 2019, in London, England. 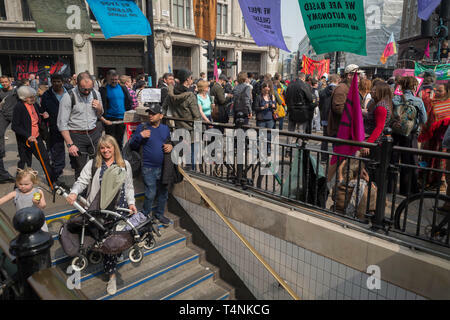 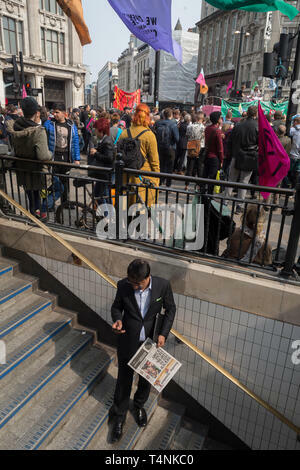 As activists with Extinction Rebellion protest about climate change in a blocked-off Oxford Circus, commuters descend the steps into the underground, on 17th April 2019, in London, England. 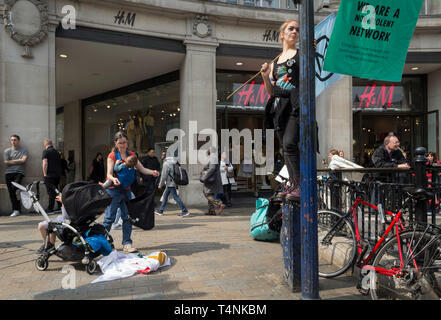 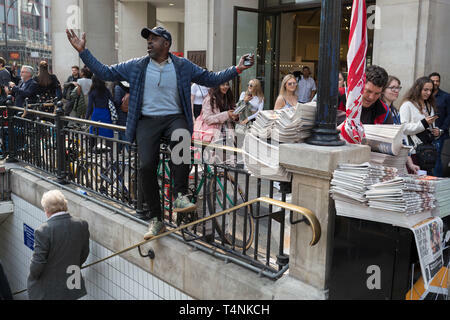 As activists with Extinction Rebellion protest about climate change in a blocked-off Oxford Circus a newspaper vendor sings to the DJ's music, on 17th April 2019, in London, England. 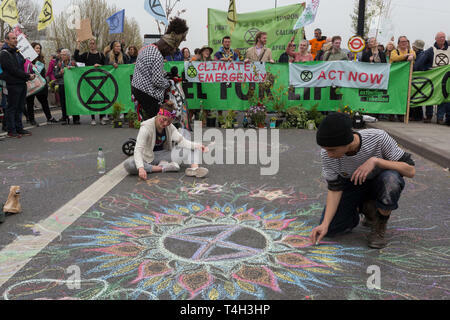 A Climate Change activist with Extinction Rebellion is arrested while campaigning for a better future for planet Earth after blocking Waterloo Bridge and as part of a multi-location 5-day Easter protest around the capital, on 16th April 2019, in London, England. 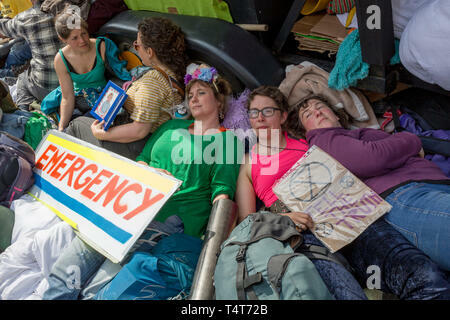 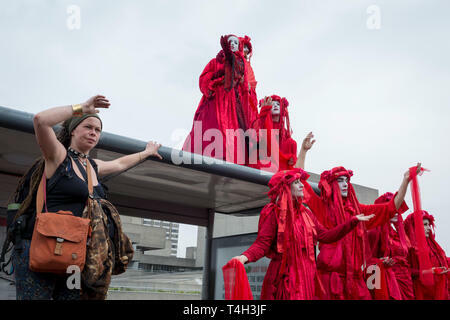 Theatrical Climate Change activists with Extinction Rebellion campaign for a better future for planet Earth after blocking Waterloo Bridge and as part of a multi-location 5-day Easter protest around the capital, on 16th April 2019, in London, England. 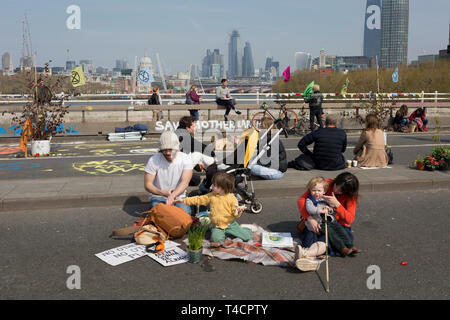 Climate Change activists with Extinction Rebellion campaign for a better future for planet Earth after blocking Waterloo Bridge and as part of a multi-location 5-day Easter protest around the capital, on 16th April 2019, in London, England. 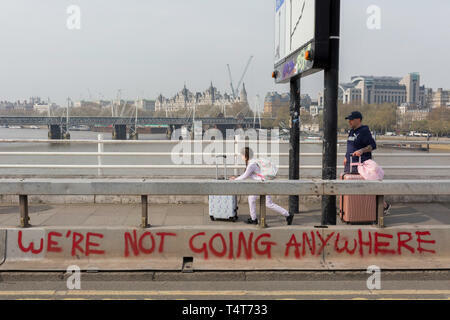 A commuter cycles past Climate Change activists with Extinction Rebellion campaigning for a better future for planet Earth after blocking Waterloo Bridge and as part of a multi-location 5-day Easter protest around the capital, on 16th April 2019, in London, England. 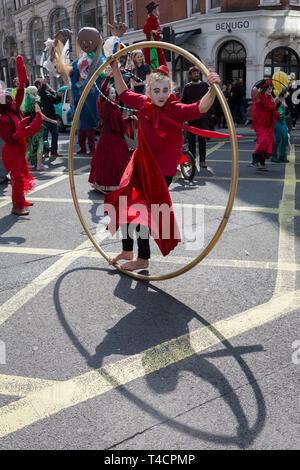 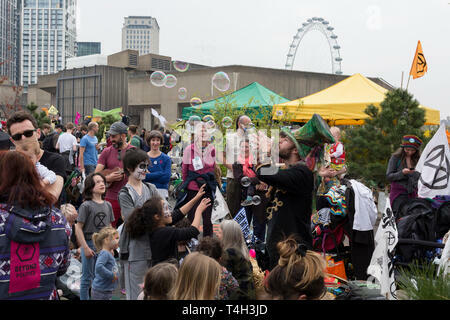 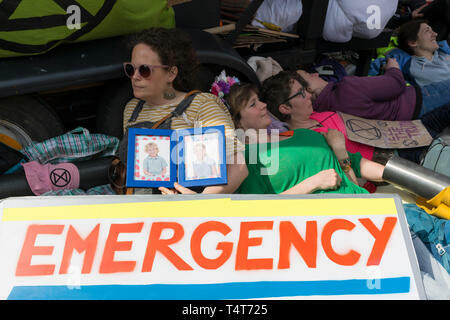 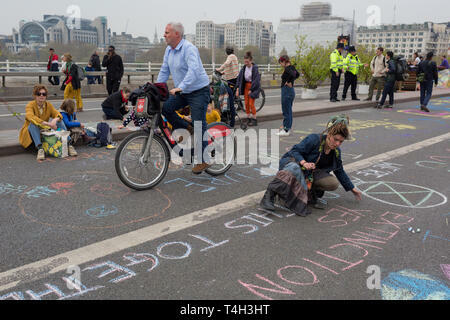 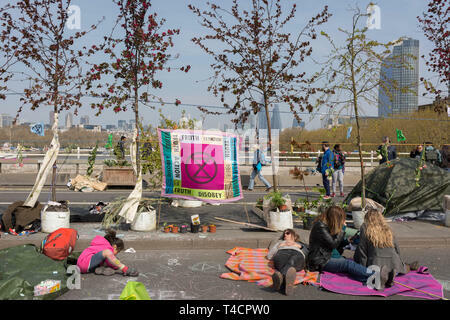 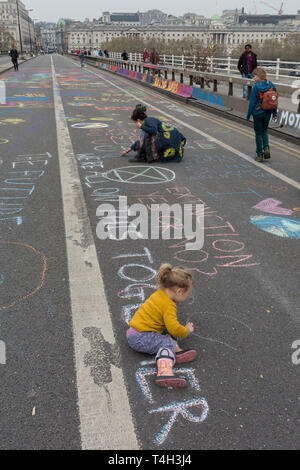 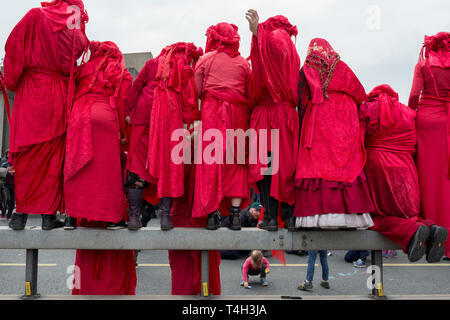 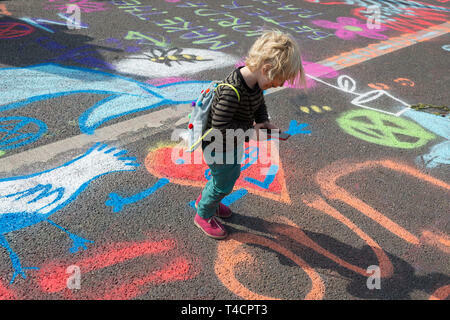 Shildren draw on the road as Climate Change activists with Extinction Rebellion campaign for a better future for planet Earth after blocking Waterloo Bridge and as part of a multi-location 5-day Easter protest around the capital, on 16th April 2019, in London, England. 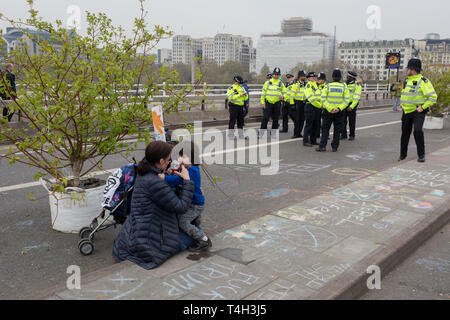 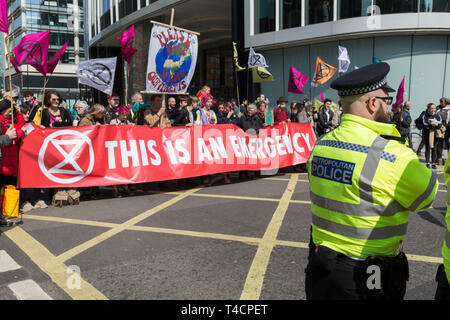 Police officers and Climate Change activists with Extinction Rebellion campaign for a better future for planet Earth after blocking Waterloo Bridge and as part of a multi-location 5-day Easter protest around the capital, on 16th April 2019, in London, England. 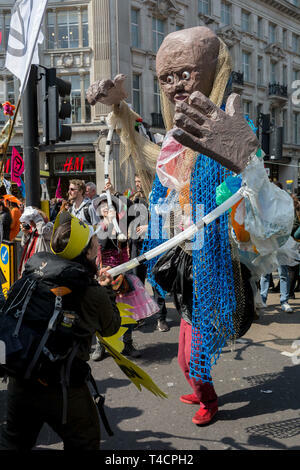 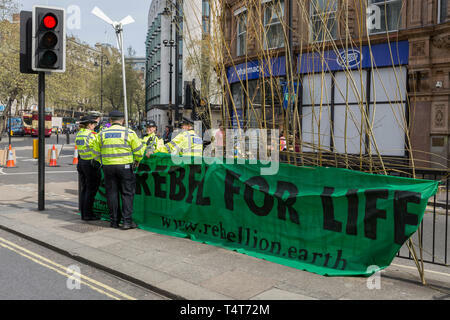 Climate Change protestors with Extinction Rebellion block Oxford Street and simultaneously stop traffic across central London including Marble Arch, Piccadilly Circus, Waterloo Bridge and roads around Parliament Square, on 15th April 2019, in London, England. 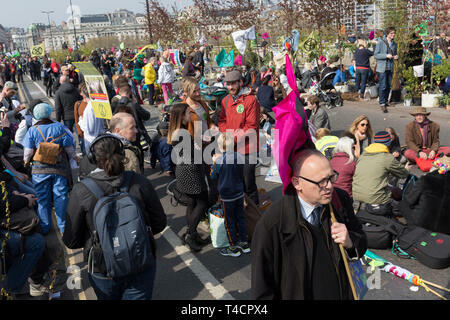 Climate Change protestors with Extinction Rebellion block Waterloo Bridge and simultaneously stop traffic across central London including Marble Arch, Piccadilly Circus, Waterloo Bridge and roads around Parliament Square, on 15th April 2019, in London, England. 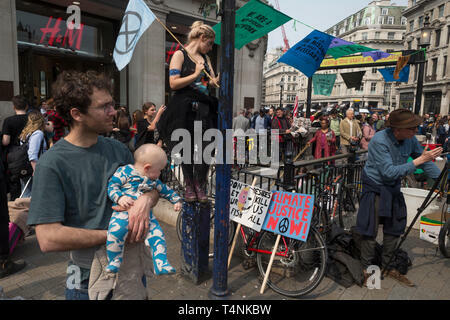 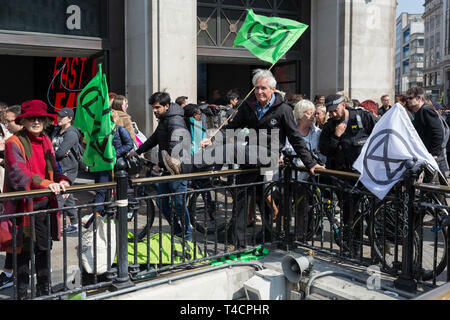 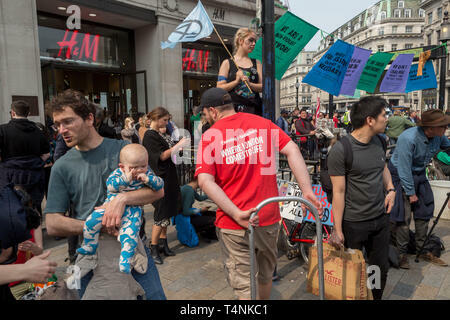 Climate Change protestors with Extinction Rebellion block Oxford Circus and simultaneously stop traffic across central London including Marble Arch, Piccadilly Circus, Waterloo Bridge and roads around Parliament Square, on 15th April 2019, in London, England. 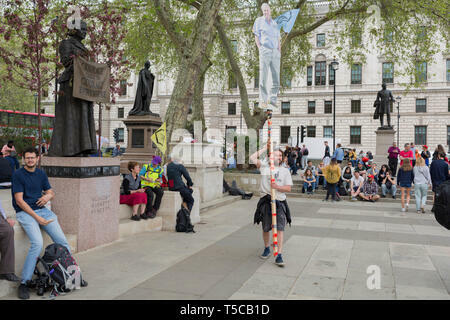 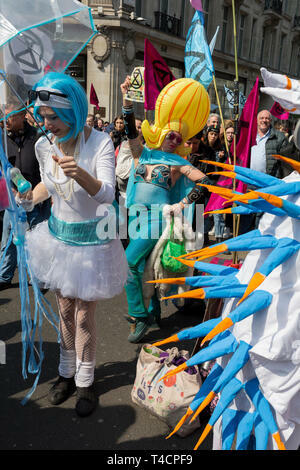 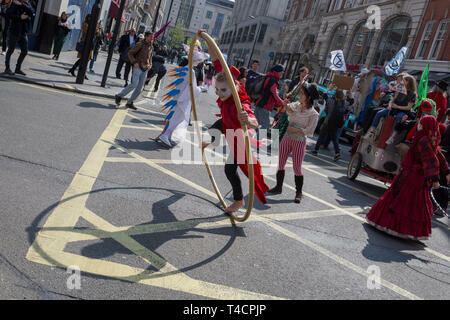 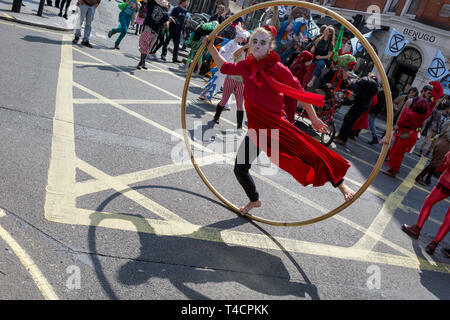 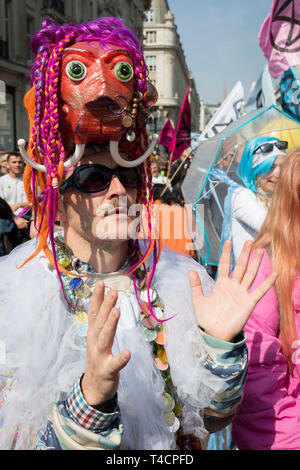 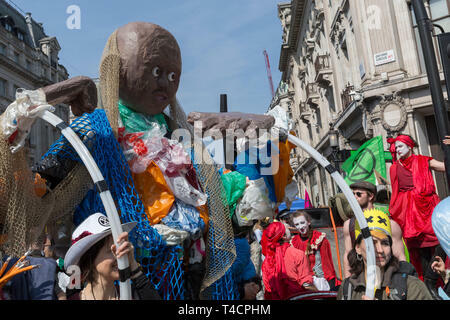 Climate Change protesting acrobats with Extinction Rebellion block central London and simultaneously stop traffic across the capital including Marble Arch, Piccadilly Circus, Waterloo Bridge and roads around Parliament Square, on 15th April 2019, in London, England. 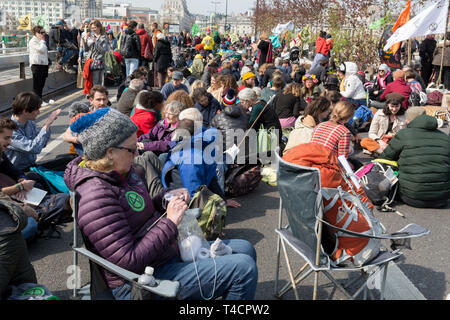 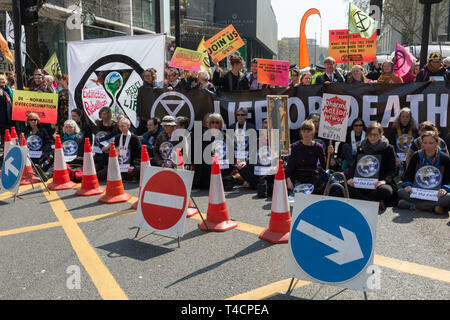 Climate Change protestors with Extinction Rebellion block Edgeware Road and simultaneously stop traffic across central London including Marble Arch, Piccadilly Circus, Waterloo Bridge and roads around Parliament Square, on 15th April 2019, in London, England.